Pay Schedule: This dropdown will list all the pay schedules you have setup. Select the applicable pay schedule for the pay run you wish to create. N.B. Automated pay runs cannot be created manually and, as such, you will notice they do not appear in the pay schedule dropdown. You will need to pause the pay schedule's automation if you want to create a pay run manually. Instructions on how to do this can be found within 'Pausing the Automation of a Pay Schedule' in this article. Pay Period Ending: If you are creating a pay run for this pay schedule for the first time, you will need to enter the pay period end date applicable to the pay run. Future pay runs created for the same pay schedule will then automatically add the pay period end date based on the first date added and the frequency of the pay run. Date pay run will be paid: If this is your first pay run for this pay schedule, you will need to enter the pay date applicable to the pay run. Future pay runs created for the same pay schedule will then automatically add the pay date based on the first date added and the frequency of the pay run. Manually add employees to pay run: You can select this option if you do not want all employees (that are normally included in the pay schedule) to appear and would rather prefer to manually add employees to the pay run. When creating the pay run with this option selected, no employees will appear in the pay run at all. This option is useful if you are creating an ad-hoc pay run to process pay adjustments, bonuses, etc for a specific group of employees. Please note that selecting this option will remove the Import Timesheets options. 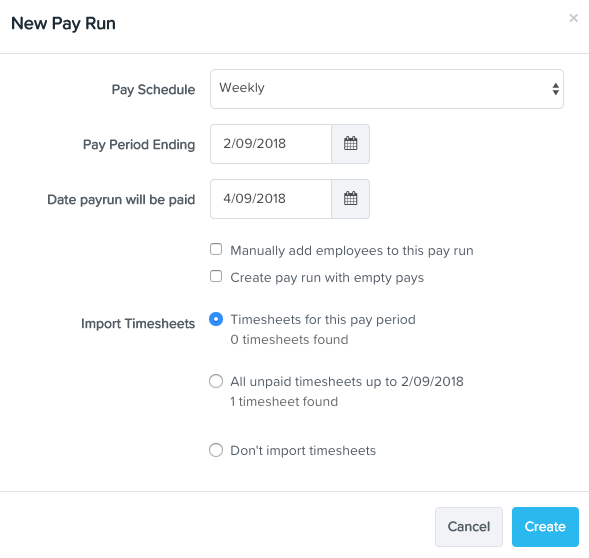 Create pay run with empty pays: If you select this option, all employee pays in the pay run will be $0. Any employee default earnings, standard work hours or pay run inclusions will not appear in the pay run. This option is useful when processing an ad-hoc pay run for adjustments, bonuses, etc and want to start with a blank canvas. Please note that selecting this option will remove the Import Timesheets options. Timesheets for this pay period: This will include all approved timesheets applicable for the pay period selected above. All unpaid timesheets up to dd/mm/yyyy: This will include all approved timesheets applicable for the pay period selected above as well as any other approved/unprocessed timesheets relating to previous pay periods. Don't import timesheets: Select this option if you are processing a pay run and do not want to import any approved timesheets. Once complete, the pay run screen will appear and you can commence processing your pays. Click here to access further articles on pay run related topics.